So much in life is beyond our control. Chronic inflammation does not have to drag you down, sap your energy, or contribute to poor health any longer. Learn how to reverse chronic inflammation through simple dietary changes with Anti Inflammatory Cookbook . It reveals the causes of inflammation and provides a how-to prescription for eliminating it through diet changes, stress reduction, and healthy weight loss. Tips to help you found causes of inflammation and provides a how-to prescription for eliminating it through diet changes, stress reduction, and healthy weight loss. More than 50 easy, tasty healthy recipes for eliminating inflammation through dietary changes. The Anti-Inflammatory Diet Cookbook for Beginners in 10 days is an indispensable anti-inflammatory diet cookbook and meal plan with one goal: to transition you to a healthier lifestyle that supports your immune system. Discover how an autoimmune diet can be easy, convenient and filled with variety and flavor. 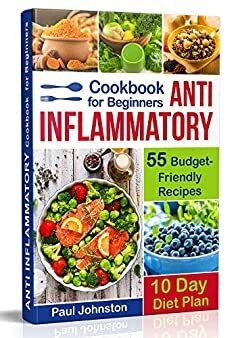 The Complete Anti-Inflammatory Diet Cookbook for Beginners will help you to begin healing your chronic inflammation sooner than you think with everything you need for making this healthy change. I look forward to getting you started on some of my most favorite recipes that I've ever shared. Trust me, it’s worth it! If you are not satisfied with your purchase, we offer you a 30-day money back guarantee. One-Click for a Healthier, Happier You!